One among too many disposable musicals springing from the war effort, this one offers - saints preserve us! - two Betty Huttons for the price of one. 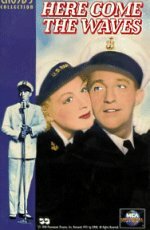 Bing Crosby is a crooner who joins the navy with heroic aims, but only sees action in the entertainment unit where he must handle shows put on by the navy's distaff side, including twin sisters both played by Hutton. After a predictable flood of broad comedy situations involving mistaken identity, Cosby, needless to say, ends up with one of the twins. Directed by Astaire-Rogers alumnus Mark Sandrich, the movie's main claim to fame is the Oscar-nominated song, Accentuate the Positive. A popular radio singer enlists in the US Navy during World War Two. His superiors decide to make the most of his popularity and order him to organise a recruitment drive - with the help of chalk-and-cheese twin sisters. Musical, starring Bing Crosby and Betty Hutton in a dual role, with Sonny Tufts.